Whether a pet, home, building, person, or other cherished object or place, a unique hand-drawn line illustration makes a lovely present or keepsake. Contact us to submit your request and receive a free quotation. Below you can find a selection of examples from Kay's portfolio of privately commissioned work. A special commission of an independent craft beer and art shop in West Norwood. Hand drawn and then printed on flyers, greetings cards, and gift cards. A hand-drawn reworking of an established brewery's logo. A logo and series of images for the Mother Box, a specialist gift set for pre and post-natal new mothers. A gift from the groom to the bride on their wedding day, depicting the church where they got married. 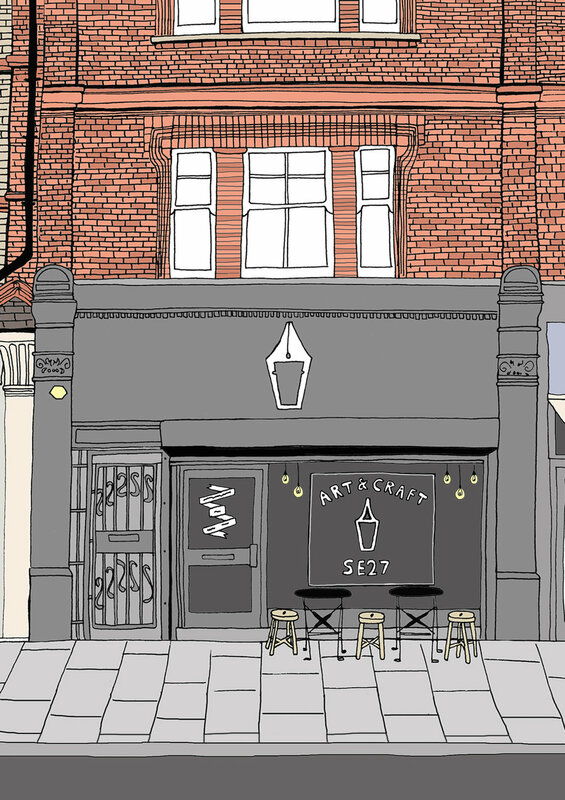 A special commission of an independent craft beer and art shop in Streatham Hill. Hand drawn and then printed on flyers, greetings cards, and gift cards. These three illustrations were commissioned by Beccy Hands, a doula and post & pre-natal specialist massage therapist based in Brighton. The illustrations show stretches and routines, and were printed on hand out postcards, for clients. A special commission of a home in West London given as a gift after the residents had lived in the property for 25 years. Hand drawn and then printed using the high-quality giclée printing method on Hahnemühle German 310GSM Etching Card. A special commission of a house in London for a company website. Private commission of the new building 'Randall court' in London, commissioned by the owner. Hand drawn and printed using the high-quality giclée printing method on Hahnemühle German 310GSM Etching Card. This private commission is of a couple's favourite pub, given as a personalised gift. Hand drawn by and printed using the high-quality giclée printing method on Hahnemühle German 310GSM Etching Card. This private commission of a home in South London was given as a Christmas gift. Hand-drawn and printed using the high-quality giclée printing method on Hahnemühle German 310GSM Etching Card. This private commission of a home in France was given as a house warming gift. Hand drawn and printed using the high-quality giclée printing method on Hahnemühle German 310GSM Etching Card. Parkhill is a council housing estate in Sheffield, South Yorkshire. It was built between 1957 and 1961, and in 1998 was given Grade II* listed building status. This was a personalised gift for a 40th birthday present. A special commission of a family home in South London as a birthday gift. Hand drawn and printed using the high-quality giclée printing method on Hahnemühle German 310GSM Etching Card. These two black and white Christmas card designs were commissioned by Renaissance Works in Bermondsey Street to send out to their clients. The cards depict local London landmarks, near the company offices. Something bespoke and unique for a special day. This illustration of St Mary's Church in West Sussex was commissioned for a summer wedding to appear on the front cover of the order of service, welcoming visitors to the lovely rural setting. Kay also illustrated save the date, invitations and wedding breakfast place and table names. This black and white portrait of St Mary's in Battersea was a first wedding anniversary present. The first wedding anniversary is traditionally the Paper anniversary, so an illustration was an excellent fit as a present. Hand-drawn and printed on high-quality 100 GSM paper ready for presentation on the happy day. Gia was six months old when this illustration was commissioned, showing her against the backdrop of her home town, New York City. Hand-drawn to a specific brief on the imagined backdrop and clothing, and capturing Gia at a tender age. This is Jake. He's a beloved cat, and this illustration was commissioned by the owner's partner as a surprise Valentine's day present. This highly personalised illustration was commissioned to commemorate the birth of a child to parents from Europe and Africa. The dress was taken from pictures of a well-loved item of clothing from the mother's childhood, while the Leopard signifies the strength and spirit of the father's homeland and identity. Some homes become a character in their own right. This illustration was commissioned to remember a home in London for a brother and sister. A scene of many late nights, parties and fun times for many people, this portrait is a reminder of those days for the people that lived them, and loved them. This personal commission was a present. 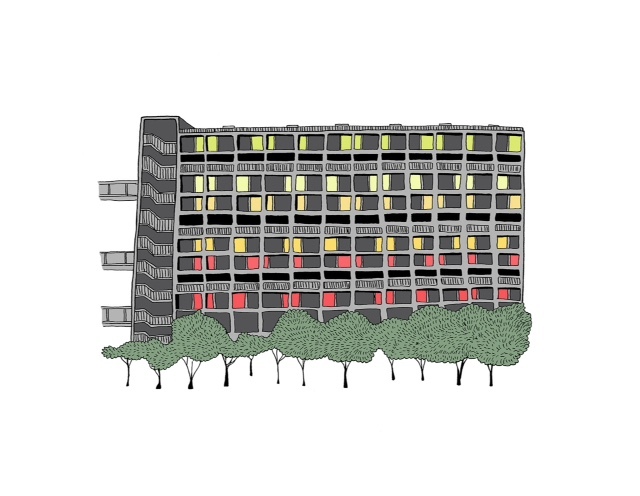 It is an illustration of a couple's first home together in South London. Every home is personal and characterful. This commission remembers all the time spent at Lydhurst Avenue. Thank you! I aim to reply to all messages within 2-3 working days, but if you need a faster response please call me on +44 7507 630776. Please complete this form to let us know if you would like to more about commissioning something bespoke and unique.